The Octopuses Are Leaving; Plague? Octopus oracle predicting the outcome of a Spanish soccer match. Image via the AP. What octopuses decide to do underwater is their business (play the bongoes with mariachi crustacean bands; solve riddles), but when they slither onto dry land to die, they’re clearly signaling to the bipeds that something must be addressed down there. Something sinister. This species, the curled octopus, usually dwells at around 300 feet below water, notes the Telegraph. Marine biologists tell them that the event is “extremely odd” and guess that the event could have to do with Storm Ophelia and Storm Brian which caused enormous storm surges and waves earlier this month and atmospheric changes. “It sounds like a fish kill event, which happens sometimes mostly in lakes and ponds that have really poor water quality,” Elisa Caref, a marine biology educator, tells Jezebel. This rarely happens in the open ocean or salt water, but researchers have been finding “dead zones” in the Atlantic which could lead to fish kills. God and/or OctoGod help us. Stones tried to put them back, but many were found dead on the beach by morning. Update 9:43PM: Dr. David Scheel, marine biologist who spearheaded the discovery of Octlantis, an octopus-engineered city, offers some background on octopus tragedy. Note: when Scheel refers to “plague,” he refers to an extreme overabundance of octopuses over the course of a season, which might explain overflow onto the beach. ...I am wondering the same thing myself. I could not speculate without knowing more about the region and recent conditions. Large numbers of octopuses have at least twice before plagued the south of England, once in the summer of 1900 and again in 1950. I have heard rumors of another outbreak in 2001 or 2002, although perhaps not as extensive. These were all Octopus vulgaris, I think and not Eledone. Update 10/30/2017: When asked to clarify “plague”–extreme overabundance of the species–Scheel confirmed this definition and then presents layers upon layers of confounding possibilities. We will continue updating as we receive further information. 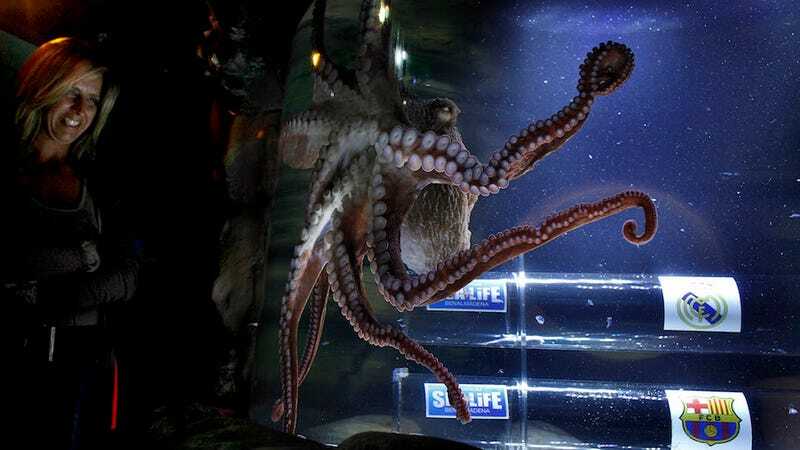 Jezebel: So perhaps an overabundance of octopuses might explain an overflow onto dry land? Scheel: That would certainly be a question I’d be asking. Along with conditions of the sea they were along the shore of–an unusually low tide? Really nice crabs just above the low tide line? Too warm or cold? Recent pollution event or enrichment? Recent food die-off? I can’t speculate what might have happened because so many factors can affect how and where animals move and I am not working in that area. The octopuses were unable to be reached at this time.